So you will never get wack nutritional advice from me, because I'm not allowed by my certification and because I never want to think that hard. It's all epistemology in the end, right? It's not that I don't believe in or love science, I think I'm actually pretty scientific. I mean, I grabbed a pair of socks off the floor the other day and they were ginormous, my mind did an allemande left and a dosido about whether humidity could expand cotton four sizes larger, and then I realized they were MJ's socks. So sometimes, scientific like that. Otherwise though, I'm a pretty good empiricist and that's actually probably why I don't put too much stock in statistics or studies. If it works for me, that's what I need to know. If you're my client, I need to know what works for you. Though this kind of reminds me of this picture of the guy who built his business without government help, so I should say that I build most of my hypotheses from the well-caramelized fond of conventional wisdom. 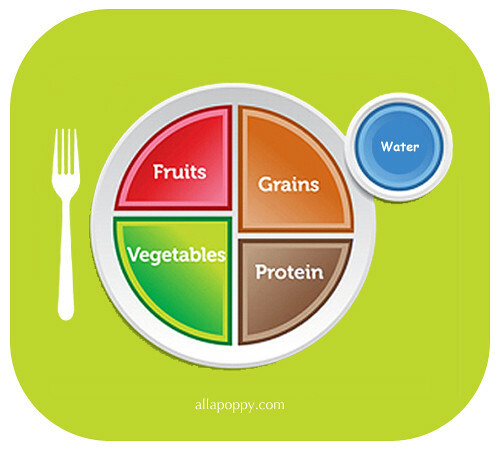 Which is basically what's allowed by my certification and which means USDA's Dietary Guidelines and MyPlate, which suits me fine because I think MyPlate is more or less okay and certainly better than some of the other nutrition graphics that I've lived through. It's way better than MyPyramid, which was the least helpful graphic ever. I know they were trying to fix the Food Pyramid, which was, like, a pyramid with carbs at the bottom. Hardly anything makes me feel old, but I felt old when diets stopped being about low fat and started being about low carb. Not that labeling bacon as low carb doesn't insult your intelligence less than labeling candy as low fat, but carbs were off the chain back then. 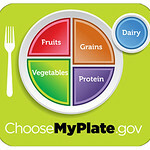 More or less okay means that I'm more okay with MyPlate being a pie chart, and also a plate, the better to visualize with, and less okay with that glass of dairy. I did a project about milk subsidies for my advertising major and you know that you can never unsee behind the curtain, and also approximately 95% of Asians are lactose intolerant. Which I have a crazy story about, maybe I already told you. Nevermind, it's off topic! Also what do you not get about a pie chart, and why is the milk blue. Which is easily fixed by making it a glass of water! I feel like that was the subliminal suggestion of blue anyway, and then the glass is okay on its own and not figured in the chart. Also what is the deal with purple protein, I adjusted the hue to brown. It bugs me a little bit that "fruits," "vegetables," and "grains," which are foodstuffs, are on a chart with "protein," which is a macronutrient, but I'm leaving it like that because that actually is how I think about that corner of my plate, which if you think about it in the way that I think about things, justifies dairy getting its own glass even less. Meat, eggs, and dairy are all protein to me. I also get protein in whole grains and legumes, but I count those as grains. Eat whole, unprocessed foods. Harvard made their own healthy eating chart because they don't trust people not to fill their plates with wonder bread and bacon. It's crammed with footnotes, silly Harvey! Footnotes are for squids! Though they did also fill their glass with water. It's not that hard, all you have to get is what whole and unprocessed means and the rest just follows. ...and still thinking that it looks like the plate in the picture, I might add. It's the effect of motivation on perception. Not to mention that spaghetti is processed, and this isn't even whole wheat spaghetti. 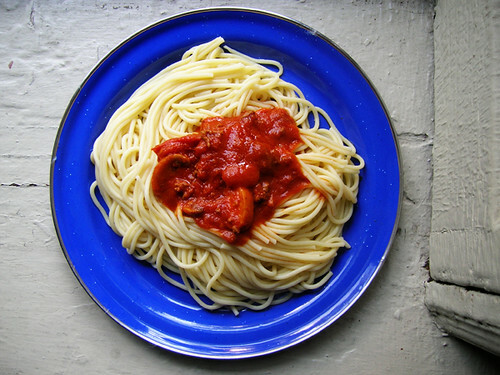 And yes, I made that plate just to be photographed and then I ate every bit of that spaghetti. I do still eat spaghetti, sometimes.